What's Going On in Ivory Coast? You are here:Home>>Strategic Research & Analysis>>Stevie C. Chiakwelu>>What's Going On in Ivory Coast? 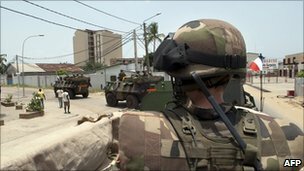 France based News Agency- AFP reported "Peacekeepers control Abidjan airport, French military says"
AFP further reported that "UN and French peacekeepers have taken control of Abidjan airport, the French military said Sunday, as clashes in the city continued between forces loyal to rival leaders Alassane Ouattara and incumbent Laurent Gbagbo." 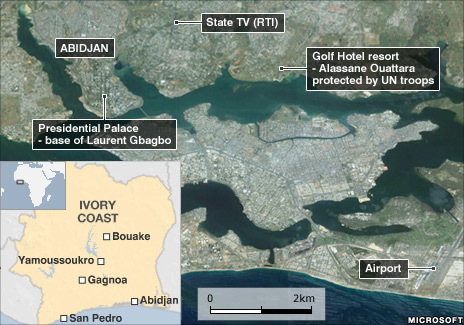 CNN reported that "The west African country of Ivory Coast - also known as Cote d'Ivoire -- has been rocked by civil conflict as forces loyal to opposition leader Alassan Ouattara seek to oust incumbent president Laurent Gbagbo after a disputed presidential election last November. Most of the international community recognize Ouattara's victory and are urging Gbagbo to go." Read 63943 times	| Like this? Tweet it to your followers!